The different types of accommodations are spread over the large park with its many facilities. There is a connected 4-pers. bungalow (NL-4493-38). This type has recently been restyled and can only be booked with a maximum of two adults and two children up to 12 years. This accommodation is not equipped with a bath as standard, you can reserve this by contacting the customer contact center, with preferred costs. There is also a spacious 6-person duplex variant (NL-4493-39). In this type, the living room and kitchen are on the first floor with a balcony/roof terrace. The bedrooms and the two bathrooms are situated on the ground floor. You will also find 6-person detached chalets with a dishwasher and veranda (NL-4493-40). Finally, there is the 14-person detached group villa (NL-4493-41). This type, which is optionally available with a sauna, has six bedrooms with box spring beds, a washing machine and a dryer. The living room and generously sized kitchen are on the first floor. This also comes with a balcony/roof terrace. The bedrooms and bathrooms are on the ground floor. The first floor is a loft level, while the ground floor consists of two separate units, each with three bedrooms and a bathroom. All the different variants are neatly furnished and each one has a garden with a terrace and garden furniture. 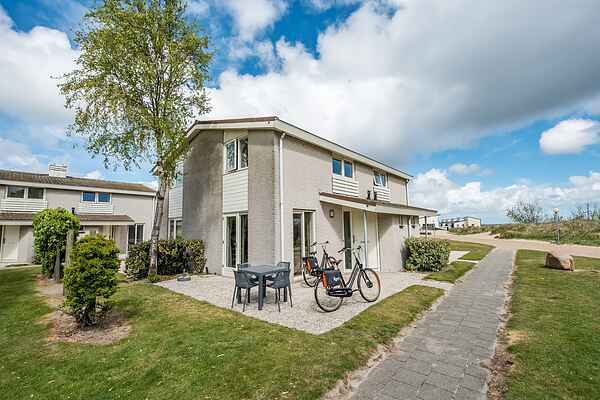 In addition to these accommodations, there are also other properties available at Roompot Beach Resort.